Part of my recent melancholy has nothing to do with the rain or the gray skies. It has to do with the fact that I am on a red carpet that is unrolling forward into uncertainty while the back is rolling up towards me. I am still in the shock of having learned that my high school buddy, Lee (Buddy) Lytton III died a few days ago and he was one year younger. It is not necessary for anybody to ask me what I want right now and what would dispel my deepening melancholy. On my mother’s side I only have four relatives left. Three are first cousins in the US and the other a very Argentine one in Buenos Aires. Luckily on my father's side there are many more and in particular two female first cousins in Buenos Aires and my other relatives the O'Reillys are warm and I go to see them once a year. A lot is being written how President Donald Trump is dragging the US into isolation. There was a similar feeling there in the mid-30s when no Americans wanted to be involved with the coming war in Europe. It took Franklin Roosevelt to force a change in that. I believe that there is now a different type of isolation which at one time may have been called cocooning. When was anybody lately been invited to a cocktail party? How about a pot-luck party? If you want to have coffee with a friend you have to make an appointment. I get phone calls from three friends and another I may have a pleasant chat if the call goes in that direction. I remember in the late 70s when we lived in Burnaby that on late Saturday afternoons Rosemary and I would go to some sort of party. Then there is a self-imposed isolation. Do I really want to go to the Commodore or a bigger venue to see an aging rock band from abroad? I have written here that I need not play any of my many versions of Gerry Mulligan playing My Funny Valentine. I listen to it in my memory. My superb stereo system with JBL studio monitors is quiet. All this is due that at one time I would have shared the tune with a visitor. Now what do most do? They post a YouTube video and just say, "My fave Frank song." I have around 600 very good movie DVDs. Rarely can I convince my Rosemary to watch any of them. We would rather be repelled by Trump's scandals on MSNBC. Here we are on our lovely bed with Casi-Casi between us and Rosemary is on her iPhone7 while I check stuff on my Galaxy. Is this an addiction that eliminates human interaction? Yes. So what do I want right now? I want to walk down Juramento in Buenos Aires to my first cousin’s apartment on Barrancas de Belgrano to have tea. She will have lovely sweet pastries and well-made tea from tea leaves (that I may have brought from Vancouver). Or I could call her up and suggest we walk together to Confitería Esmeralda (on Juramento). In Buenos Aires confiterías are sort of sit-in bakeries, tea joints, where you can have a classic British tea with everything including sandwiches without their crusts. The Esmeralda is special because as a boy my mother would order my birthday cakes from there. But there is a problem. My first cousin and godmother Inesita O’Reilly Kuker is dead and has been now for two years. 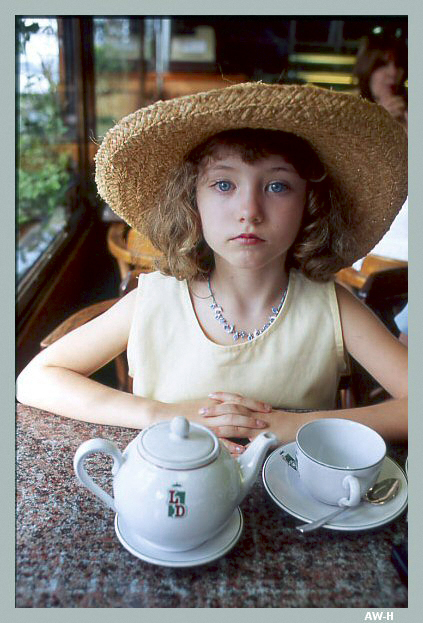 Perhaps I could have tea with my granddaughter Rebecca in Punta del Este in Uruguay. She is now 20 and has other interests. She would not be willing to jump into an airplane with me to go to some country to have tea. I guess as one gets older life gets simpler. Problems are no longer seen as important. But there is a catch in this. The catch is that the former simple things of life are not to be had now. While in the Argentine Navy I found out a little obscure rule that said that if I produced a proof of having donated blood I would get a day off. I would go to the British Hospital in BA (once a month even though I have a pathological fear of needles) and give blood. This came with a "Té Completo" which consisted of tea with goodies. Armed with my certificate I would get the next day off.